Lets have a cocktail...: I have long forgiven you for the Irish Spring. I was a fluke. One of those biological combinations determined to come into the world regardless of all that planning and precaution you used. You were thrilled even after thoroughly explained the risks. You prayed for a pregnancy not nearly as difficult as my older brother provided. Well, you quasi-received your wish. I was a much easier pregnancy but as you brought me home in that sweet yellow number, you were unaware I would be a far sassier child. You knew you were in for a long stretch when at age four I told your mother’s friend she called him retarded when she actually said he was retired. And for the next decade (or two) there was not much of a break. But I might have inherited that trait from you. Remember when we played Taboo and the word you were supposed to guess was “ATTORNEY” so when one of your other children gave you the clue “What is JennyMac?” The answer you provided, FLAT, was incorrect. But I inherited a little bit of no nonsense from you too. Recall when I was about six and told TW to shove it even though, clearly, I had NO IDEA what it meant and only repeated what someone else in our house stated once. You told me to come into the house and get my mouth washed out. NO WAY, LADY. So I took off running. Umm, you started running too. Without even a pause for breath, you basically mocked me as you went running past me and said, “You have to come back sometime.” And I did. And wasn’t the embarrassment you shed upon me having outrun me enough? Did you have to actually put Irish Spring in my yap? NO. And did you have to select the largest green bar of it you could? And when in high school, I had a gaggle of friends over and you asked me to do something or else. I asked, “OR WHAT?” You promptly raced in that room and with a swing kick to the back of my legs, took me down and then pinned me and said, "THAT IS WHAT." Damn woman, I had no idea such a powerhouse was hiding in your tiny 5’4 body. I should have learned my lesson with the soaping incident. And after moving away to college and then grad school, coming home was still a favorite. To our crazy nights out with your girlfriends as we tore up that dance floor at the dirty blues bar, to chatting at Cutter’s over cocktails, the history of our memories are an awesome string of technicolor vignettes. We have laughed so hard we have cried. And I have cried so hard at times, there was nothing left to do but laugh. Anytime something has truly been disjointed in my life, you were the person to call. The instant I heard your voice, I could hide nothing. And in that narrow space of time, you knew before I uttered a sentence that I needed you. As a freshman, a girl I had known my entire life was killed on the way to school. My Father said, “People die, Jen.” TRUE but no offense, DP, not exactly from the Institute of HALLMARK. But you knew I would be overwhelmed and likely incapable of processing something so big and raw. This was pre-cell phone era so instinctively, you left your office, and called my StepDad. The two of you made haste driving to my school to search the faces of 1500 kids until you found the one that belonged to you. With vivid clarity, I can remember not only exactly where I was when I looked up and saw you both but also, the tremendous sense of belief that you could help me make sense of it. And if not make sense, you would alleviate the level of awfulness surrounding and choking everything that day. I am not the only one who knows that you often leave people better than you found them. But, in addition to that, it was every time you colored the sugar on holidays, or made us pancakes for dinner (which we loved.) It was being in the first row for every concert, every game, every talent show, every speech, and every event. Making whale pillows with us at my elementary school (in retrospect, you should have helped me more, mine was quite scary) to making every birthday feel like a national holiday. All examples of how easily you demonstrated our importance to you. Growing up, I had everything I needed (except a bigger chest) and as an adult, we discovered it is ok to have differences of opinion. I know I have made you laugh, made you cry, made you proud, and likely have provoked you to wonder if we are, in fact, related. But your support and belief in my ability to achieve anything will cling to me for life. Everyone needs someone to champion them along, and I have no bigger champion of me than you. You once asked me in a moment of your own personal entanglement, how I became a stronger person than you. I am not necessarily stronger but if I had to answer it is because I had a Mom like you, and you did not. But those window panes of adversity you burned through with tenacity. And a vow to ensure your children knew they are incredibly loved. I promise you, we know. And no one loves us more than you do. And I have long forgiven you for the Irish Spring. As you have forgiven me for "borrowing" your black pearl necklace and losing it. Wait, you knew that right? Everyone whose life you touch is lucky. For your wide generosity, that lowdown sass you predominantly keep under wraps, to your ability to decide after age 55 to take up Equestrianism as a new hobby, you make being over 60 years old look better than I have ever seen it. I am certain Cher will ring you for some tips. This picture from my wedding is a perfect example and you were the most beautiful person there. Today is a great day to be celebrating you. And what began as a fluke for you, turned into incredible serendipity for me. Happy Birthday Mom. Both internally and externally, you are more gorgeous than ever. What a glowing, birthday tribute. Hope your Ma appreciates it! What an amazing tribute! You've been very lucky to win that genetic lottery! You sure know how to write a wonderful tribute. She sounds like a winner. And she looks great too. Happy Birthday to your mom. That is so beautiful. I hope my daughter has such glowing things to say about me one day! Aw, that's so sweet. I want to be that kind of mom. I've got a long way to go! Ooo that is so cool, sweet and moving, Happy Birthday to your Mom! Powerful and lovely and inspiring. Happy Birthday, Jenny Mac's Mom!! Happy Birthday Darling! I hope my daughter will write nice things about me one day. Lovely tribute to your Mom, JennyMac. Blessings to you both on her birthday. "We have laughed so hard we have cried. And I have cried so hard at times, there was nothing left to do but laugh. Anytime something has truly been disjointed in my life, you were the person to call. The instant I heard your voice, I could hide nothing. And in that narrow space of time, you knew before I uttered a sentence that I needed you." So true with my relationship as well. Only my mom didn't use soap, she used Tabasco sauce. As always, your writing is beautiful and your memories are so vivid they jump off the screen. This is beautiful JennyMac. You have such a great way with words. Happy Bday Mom!!! Gorgeous JM. You are a testament to how great your mom is. Thank you blog friends for your birthday wishes. This will be one I shall not forget! She sounds like a special lady...and your tribute to her shows what a great daughter you are. Happy Birthday! this is a lovely tribute to your mom. What a great way to honor your Mom! Happy birthday to her from me, too! What an amazing tribute to an amazing mom. The love was tangible in the reading of it. Happy Birthday to your mom, and have a great day to you! That was beautiful!! Happy Birthday, Mom!! Lovely post for your mom. I hope she has a terrific birthday! I wrote a little comment about this blog and put it on my facebook page. I hope I can hook more readers into your day to day...Thanks for a style of writing that brings tears at times and laughter more often than not into my home! You always write such beautiful things to your family members! Happy birthday to your mama, who has clearly made you the wonderful, beautiful, witty woman that you are! You BOTH looked gorgeous on your wedding day! I heart the red detail on your dress. That was so touching, hilarious & sweet all wrapped in one. Happy Birthday to your mama!!! Another great post! I hope your mom has a wonderful birthday. That picture has two, very beautiful and very remarkable women in it. Happy Birthday, JennyMac's Mom (and thank you for JennyMac). I wish I had this kind of relationship with my mom. Yours sounds so great. 1. LOVE your wedding dress, totally gorgeous. Red on it, FAB! Ok, but what i really wanted to say is...this post is all kinds of AWESOME! It is so beautifully and well written. I feel like I "know so much" about this amazing woman that you call Mom. She sounds so fun and wonderful. 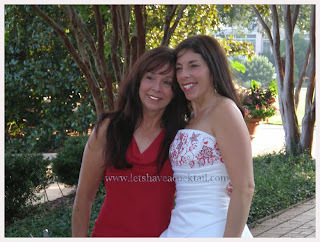 And, ultimately, she is as lucky to have you as her daughter as you are to have her as a Mom. What a great treat for you mom. She needs to be one of my sensational women on Saturdays. Oh Jenny Mac, your tributes to the loves in your life always bring tears to my eyes. Happy Birthday to the mama of Jenny Mac. This brought me to tears and I am still trying to swallow the lump in my throat. I am tempted to flirt with plagiarism come November, change a couple of the details and pass this on to my mother on her birthday. I will be able to leave the soap story and the undercurrent of sass. Having mothers like these absolutely enable us to be better mothers, better wives and better friends. Great, great job celebrating your mother and paying a funny, touching tribute. If your mother is anything like mine, she will print this post, frame it, and hang it in her bathroom. Wow, this totally made me cry. Beautiful. Absolutely beautiful. Happy birthday to your momma! This was so special!!!!! What an amazing tribute to your mom! Why do you have to make me cry. Geesh. Happy happy bday to your beautiful mama!! What a beautiful and special tribute! I am a new follower from Friday Follow, so glad to have found your blog. Hope you have a beautiful weekend! Wow what a great Mom and what a wonderful daughter she has so lovingly raised who is now able to write so beautifully about her. "I am not the only one who knows that you often leave people better than you found them." That pretty much sums up a really good mom, huh? Happy Birthday MommaMac! Awwwww---lovely post and tribute! So many wonderful details too!!! Happy Birthday to your mom! Happy birthday. A lovely tribute. What a beautiful birthday present for your mom. You are the best! If that doesn't make your mama cry, she's on somethin'! That was a beautiful way to show your mom how much she is loved and admired. Good on you. JennyMac, I am certain that MommyMac feels just as fortunate as you as you do to have her. And you are, indeed, fortunate! That is so beautiful!! You are a very lucky girl to have such a wonderful mom and she is lucky to have you!! That is so beautifully written. Happy Birthday to your mom. This got to me. Beautifully written and wonderfully said. I love that your mom became the things her mother may not have been. Tear. Oh my goodness! I am in tears. Happy Birthday to your gorgeous mother! She obviously deserves this moving tribute. I hope one day my daughter feels the same way about me. This is the sweetest birthday post ever! You are both lucky women. What a funny, loving tribute! Hope her birthday was happy!! Lovely :) and she is GORGEOUS! Happy Birthday to your mom! What a sweet ode to your mom, btw, love your dress in that pic. I love that your mom took you down. Think I'll be able to do that with my boys when they are teens? This was a great tribute to your mom. Happy Birthday to her! That was just plain beautiful! Aww, this was sweet! What a tribute! My mom's b-day is July 4th and you've given me a wonderful idea! Thanks! What a beautiful tribute to your mom! It's inspired me to write a letter to my mom telling her what she's meant to me. Thank you. I'm here from Texan Mama's place. This is a beautiful tribute.